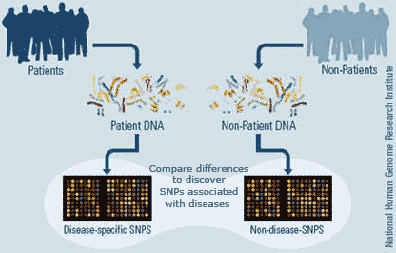 The SNPs of both groups are analyzed and compared. Researchers hope to identify a particular SNP(s) present in the disease group that is not present in the control group. If such a SNP or SNPs are located, then researchers have identified a genetic sequence that has an “association” with a particular disease. By collecting an ever-increasing amount of DNA sequence data, researchers are able to see if more people are following the trend that a certain allele is correlated with a certain disease. To date, thousands of diseases and traits have been investigated by GWAS, including: height, type 2 diabetes, pigmentation, epilepsy, body mass index, Alzheimer’s disease, autism, Crohn’s disease, breast cancer, bipolar disorder, asthma, and high cholesterol. GWAS are the basis for most direct-to-consumer genetics companies. When drawing conclusions from GWAS, it is important to recognize that the relationship of identified SNPs to a particular disease is only an association. In most studies, it remains unclear how or why a particular SNP has a relationship to a disease or trait. Consequently, some people will have the risk variant of an allele and not have a disease, while others with the disease will not have the variant. Often the results of GWAS are presented as an odds ratio, which is “a measure of the odds of an event happening in one group compared to the odds of the same event happening in another group” (cancer.gov). A percentage increased risk of the disease to an individual carrying a risk variant can then be calculated. * Most common traits and diseases are impacted by the environment and lifestyle decisions, not strictly genetics. * The odds encompass the risk of an individual getting a disease over his entire lifetime, even if the risk changes over the individual’s lifetime. For example, there may be a 80% chance of a person getting colon cancer by the end of their life, but only a 10% chance of getting it before age 65. * Most diseases and traits are controlled by numerous genes. Therefore, the impact of one particular gene may be minimal.